Design custom shopping bags with your favorite photo reproduced on canvas and trimmed with Italian patent vinyl. Popular and stylish, these personalized shopper bags are awesome for shopping and leisure time. Size 13.5 x 13.5 x 5"
Fantastically-made customized bags with your personal photos. This personalized shopper bag or beach bag is available in four gorgeous colors (soft pink, black, pale blue, and ivory beige). I designed a shopping bag for my mom's birthday and was so excited to find that the images were exactly the same and it arrived right on time! There is no better feeling then knowing your bag is a complete original and completely styled by yourself. Bags of Love continues to impress me with their hard work. easy to design and great customer service! Treated myself to a nice little gift that I can use everyday! Great quality and material. When selecting your image for your shopping or beach bag, remember that this bag is made from a square panel containing your image. Therefore, depending on the dimensions of the photograph you provide, we might have to crop your image to fit on the square panel. Our trained in-house professionals will make sure to crop the image in the most logical way (and won't crop out the main subject). We advise that you use portrait shots as they generally work better. Wide landscape photos do not work as well due to significant cropping in the production process. Do note that you will be able to view your personalized shopping bag in the preview before purchasing. Perfectly square to maximize your shopping potential, we print your photos onto supple canvas and then hand cut the thick vinyl fabric to order. Our sewing and textile professionals assemble the bag by hand, ensuring the quality and finish are of an excellent standard. The real leather handles are placed in-between the vinyl and canvas fabrics for maximum strength. We’d suggest choosing images that follow a similar frame. Get the shopper bag personalized with yummy images of cupcakes or mouth-wateringly fresh apples in bright green. 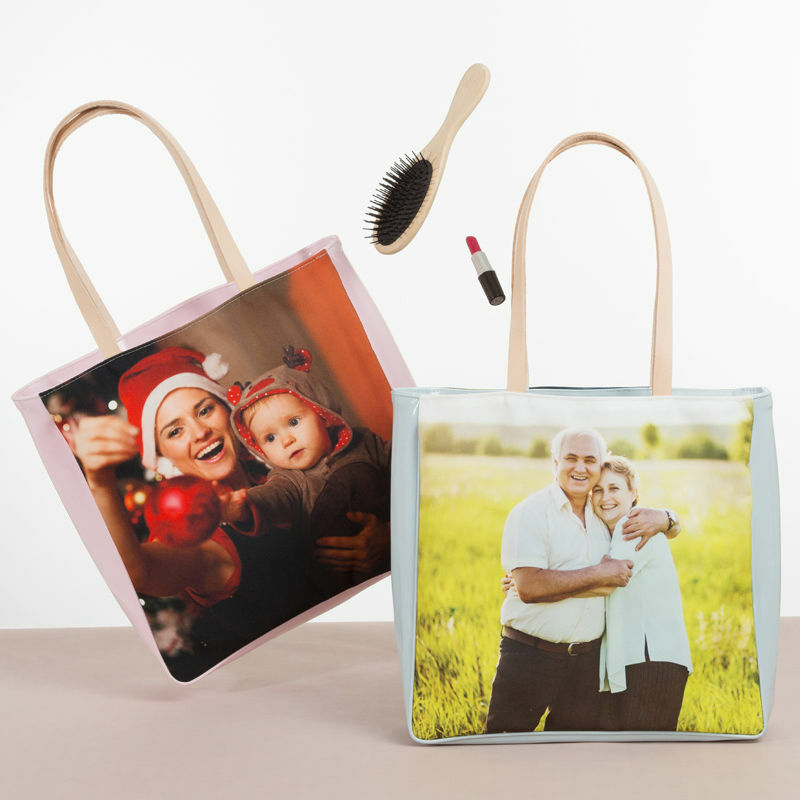 As a special gift for mum or grandma, customize their shopping bag with a photo collage of family snaps that’ll be a conversation starter wherever they go. Animal lovers will really appreciate an adorable photo of their pet for the times when they miss them whilst out and about. Photos printed onto canvas come out in bright, bold colors, however black and white personalized handbags look super chic too. Treat your grandma to a new, more stylish way of hitting the high street with a custom shopping bag that’s lightweight but durable. Plastic bags can often break and fall apart when you need them most, so a glossy patent vinyl shopping bag is the best way to stay eco-friendly, reusing it time and time again. No doubt your mum has once or twice forgotten to pack the reusable bags, so make her life easier with a custom designed shopping bag that looks just like a fashion handbag.